Today, we celebrate the letter "G!" 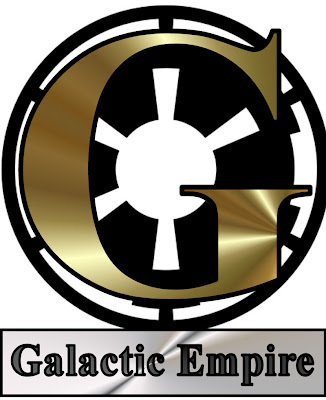 G is for Galactic Empire. I could've filed this under E for "EVIL" Galactic Empire (or simply "Empire"), but we'll relegate it to the "official" name. The Empire, simply put, represents all things reprehensible in the Star Wars universe. We're talking idiotic bureaucracy, we're talking xenophobia, we're talking Dark Side of the Force. Totalitarianism, subjugation, slave labor, corruption, suppression of civil liberties. The Galactic Empire is monolithic, seemingly made to last for infinite years, seemingly built to control everything. Of course, these things never last. People don't like having their freedoms erased. They don't enjoy it when regimes build weapons of mass destruction with the capacity to destroy entire planets. They don't enjoy it when certain a Grand Moff intimates that "fear will keep the local systems in line." Thus, overly ambitious in its design and execution, the Galactic Empire was too big to rule, while the Emperor and his minions thought it was simply "too big to fail." TOMORROW: The letter "H." It's a cold one.